Super-aggressive, nylon brush makes short work of stubborn bore deposits. Extra-stiff, large diameter bristles are safe on rifling and smoothbore surfaces. Wont deteriorate when used with your favorite solvent. Strong, one-piece, looped and wound brass shank and coupling prevents scratching. 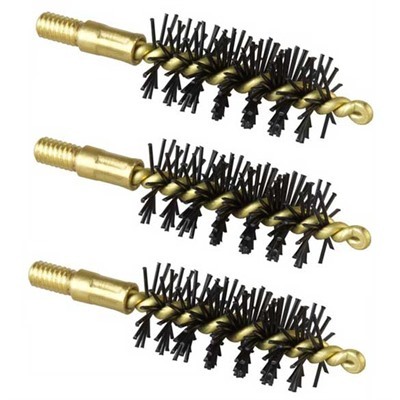 Mfg: Brownells SPECS: Bristles: Heavy weight (HW) nylon. Shank: Brass, looped and wound. Rifle: 3 1/4 (8.3cm) OAL, 8-32 thread. Pistol/Revolver: 2-1/8 (5.4cm) OAL, 8-32 thread. Shotgun: 2-7/8 (7.3cm) OAL, 5/16-27.